Fundação Oriente is delighted to present The return of Camera Lucida in the Digital Era conference & the exhibition India Drawings by Dr. Pedro Maia. The return of Camera Lucida in the Digital Era conference will focus on the nineteen century drawing device and its possible applications and efficiency for academic surveying techniques in Fine Arts and Architecture, historical purposes and present artistic applications. The author will also analyse other drawing devices from the fifteenth century onwards, such as the camera obscura, and put into context the tradition and usage of drawing and measuring apparatus to survey and depict reality before the discovery of the technical principles that led to photography. 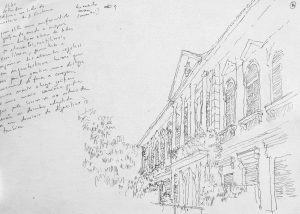 The exhibition India Drawings displays 28 Camera Lucida sketches from a wider collection of around 180 drawings made in India, between October 2015 and February 2016 including places such as Panjim, Old Goa, Mumbai, Hampi, Rishikesh, Varanasi, Jaipur and Pushkar, and are representative of different usages and applications of the drawing device. These drawings, although they could be easily seen as an artistic depiction of landscape and architecture, are essentially scientific and research documents that will lead to future speculations on the possible uses of the device in the digital era. Pedro Maia is an artist, researcher and Professor in the Drawing Department at Faculty of Fine Arts in the University of Porto and has been teaching Drawing since 1988. Having studied Painting, Sculpture, Drawing, Photography and Video, in Portugal and in the United States of America, he specialized in Drawing Machines in his PhD studies in Oporto’s Fine Arts Academy and in the University of Barcelona in Spain. He has been exhibiting his artwork since 1985, essentially in the fields of Painting, Drawing, Photography and Video in Europe, Africa and in the United States of America. The exhibition will be on display till the 9th of December at Fundação Oriente Art Gallery in Panjim, Goa.